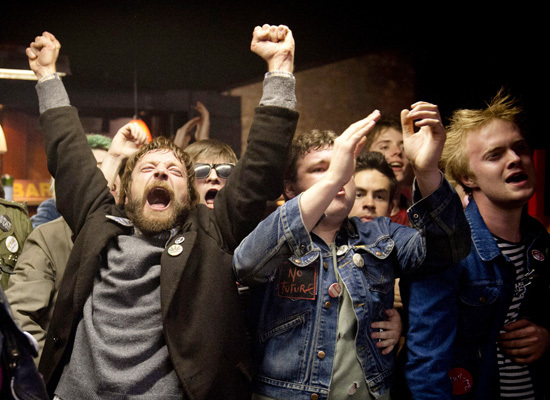 The Film Club continues at the Glad Cafe on 11 March at 8pm as we screen Good Vibrations, the story of Terri Hooley, the rebellious Belfast punk enthusiast whose record label released the Undertones’s Teenage Kicks. Synopsis: Terri Hooley is a radical, rebel and music-lover in 1970s Belfast when the bloody conflict known as the Troubles shuts down his city. As all his friends take sides and take up arms, Terri opens a record shop on the most bombed half-mile in Europe and calls it Good Vibrations. Through it he discovers a compelling voice of resistance in the city’s nascent underground punk scenes. Galvanising the young musicians into action, he becomes the unlikely leader of a motley band of kids and punks who join him in his mission to create a new community, an alternative Ulster, to bring his city back to life.